If you’re good at these shots, you’ll score pretty well. 1. Being able to hit the green reliably from inside this distance is the origin of good scoring. More than any other, this shot determines what your score will be. You will shoot much lower scores if the shot after this one is a putt rather than a chip. 2. You should be able to get up and down at least half the time when your ball is only one or two yards off the green. This skill is probably number two in importance as a back-up to your irons, since no one hits the green every time, even from close in. 3. Driver eventually, but use your fairway wood if the driver is too hard to control. 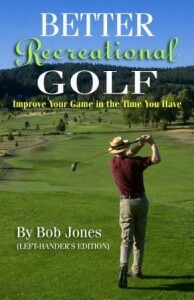 You must get the ball in the fairway to have a chance to get a good score. If not, you’re playing damage control for the duration of the hole. 4. Approach putts are important, too, because leaving them short is the primary cause of three-putt greens. But these little putts are a chance to close out the hole. Missing two or three of these per rounds hurts your score needlessly. 5. This is a mini-version of the iron into the green, but with something added: you must be able to pitch accurately to a known distance. On the green is good, but you can do better than that. If you’re 78 yards from the pin, for example, you should know how to get the ball within five yards of it. When I go to the range, I take my driver, 6-iron, sand wedge, and putter. Sometimes I’ll substitute and 8-iron and a gap wedge. But with just four clubs, I can practice all these five shots. Has this happened to you? You made a swing change, it worked great for a few rounds, and then it stopped. Not only did it stop, all of a sudden you had a new problem you never had before and now you don’t know WHAT to do. I’ll tell you what went wrong. Whenever you make a swing change, the thing you’re doing differently feels, well, different. It feels new. You work on the new technique to get it right, and since you can’t SEE what you’re doing, you rely on the FEEL of the new move to recreate it. So far, so good. But after you get the new move down pretty well, it starts to feel natural and not like it did when it was new. Here’s where the trouble comes. You keep trying to make it feel the same way it did when you first tried it. The only way you can do that is to do the same thing, but too much of it. You go too far. You over-correct. By chasing the feeling, which is now obsolete, you create a swing problem you never had. So here’s what to do. Get a full-length mirror. When you learn your new move, learn it by looking at it in the mirror. That way you can see what you’re trying to do. It will have a new feeling, but DISREGARD the feeling. Trust only what you see. Work on that new move daily, just for a few minutes, in front of the mirror, until you find that you do the new move right the first time you try it. I would not be surprised if at the time it takes for that to happen, the feeling you had when the move was new will be gone. There will, unfortunately, be a period when you are adrift between the old way and the new way. Best not to play golf during that period, unless you don’t care what your score is. This is all the more reason to work on this new move every day, to hasten its assimilation. That’s the key, though. 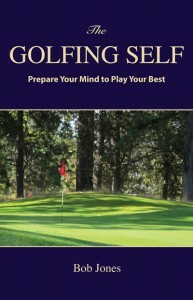 Even though golf is a feel game, learn to rely on what feels right, not what feels new. Distance in golf is cool. Distance is fun. But at the recreational level, where we get to play from whichever set of tees we want to, accuracy is King. To show you why, consider the ability to hit just two particular shots, over and over. They are the tee shot into the fairway, and the 5-iron from the fairway. If you can hit these shots straight, you can hit the green in regulation on five out of six par-4 holes on your golf course. That also means you can hit the green on every par five in regulation. That means you can hit the green on at least two of four par 3s. Guess what you would score if you did that? The tee shot into the fairway needs to be hit with the longest club that you can put into the fairway three times out of four. Even the professionals don’t do better than that. But if you can do that too, you’re playing the hole on offense instead of playing catch-up. The second shot, the 5-iron from the fairway, is more demanding. That will take a bit of practice. Start with your 9-iron and gradually work up. All this is predicated on playing from the set of tees that are appropriate for the length you have. Multiply your average drive, in yards, by 25. That’s the length of course you should be playing. I know, hitting the ball straight is probably the biggest problem a recreational golfer has to solve. Easier said than done. One way to do it is to dial back and stop trying to hit the ball a long way. Play well within yourself. It doesn’t matter how far you hit your 5-iron, for example. It does matter that you hit it straight. If there are other problems in your swing that cause the ball to veer left or right, get them fixed with lessons and practice. Golf does not ask that much of you. The game is not really that difficult. Build it around making clean, accurate contact with the ball, rather than powerful contact. Make a mantra of, “Easy swing, straight is good.” With that attitude, and these two basic shots, you can play very good golf. I see recreational golfers use up strokes unnecessarily in several ways, but the big one is from 50-100 yards. Few I play with can put the ball on the green consistently from that range. What I’m going to talk about today is really simple. Anyone can do it. It’s solving this problem by acquiring pre-defined wedge shots that go to known distances. Take out your pitching wedge, and practice making two swings of defined length. The first swing is taking the club back to where your hands are level with your hips. The second swing is taking the club back to where your left arm is parallel to the ground. Check yourself in a mirror as you’re learning what these swings feel like. Often, where it feels your hands and arms are, and where they really are, are different. Now you have two swings. At the range, hit pitches with the shorter swing to flags that are close in, such as the 75-yard flag and 100-yard flag. You might not land the ball exactly on those spots, but you should be able to estimate the distance the ball is carrying. Repeat with the longer swing. 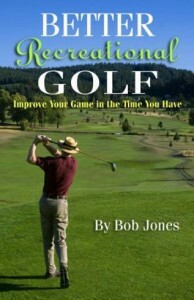 When you’re finished, you will know how to hit the ball to each of two specific distances. I hope you have more than one wedge. Your pitching wedge comes with the set of irons, and you should have a sand wedge, in the 54-56 degree range. If so, repeat the exercise with this wedge. Now you have four distances. And if you have a third or a fourth wedge, calibrate those, too. Now you have four to eight distances, using two swings that are easy to repeat. There will be distance gaps, but you can fill those in easily when you play. The best way to do that is to use a club/swing combination that is short of the distance you face, and hit the ball a little bit harder. Easing off instead can turn into quitting on the shot. It might also be the case that two club/swing combinations give you distances that are very close to each other. That’s all right. The combination with the more-lofted club will stop quicker, and the shot with the less-lofted club will run out a bit after landing. It’s good to have both choices at your disposal. No matter how much we practice, build our game, learn about it, know what we are capable of doing, and when to do what, there is no escaping the moment of truth — the time when you have to take the club away and hit the shot. Golf, no matter what your level of skill, is played in this moment. To make golf easy, you need to make this moment as easy on yourself as possible. How do you do that? How do you make the beginning of a shot a movement full of confidence rather than infected with doubt? Quite simply, you play well within yourself, well within your capabilities. You play shots you know you can hit, which do not require your best, but only your average skills. Reflect for a moment. I’m sure you’ve been through this before, many times. At the driving range, you hit one shot after another that is as fine as you can hit You begin to push ahead to expand your limitations, and often succeed. After all, that’s what the range is for — not only to maintain the skills you do have, but to take them to a new level. But when it comes time to play, things change. You’re not out there to find out what you possibly could do, but what to apply what you know, really know, that you can do. That’s a very different way of hitting a golf ball. You get conservtive. You don’t go all out, you don’t play on the edge. Your game closes in to what you feel absolutely sure you can do. That’s why, for example, while we’re learning an improvement on some technique, but have not yet mastered it, we abandon the improvement and go back to what we know, even though we are aware it is what we are trying to move away from. We go back to what we have confidence in being able to do it well, even if it is not what we actually want to do. There is an average quality of shot that you hit, not your very best, not your worst, either, but one you know you can toss off whenever you want to. That is the shot you should play golf with. Asking more of yourself than that seldom pays off. Trying to hit shots that rate nine or ten is often what leads to hitting shots that rank one or two. As you take the club away, don’t expect great things of yourself. Hit your average shot, one that gets you in the middle six. That will prevent the pressure to perform from becoming too great. It will lead to a more satisfying and relaxing round, and I might also say, a lower score. 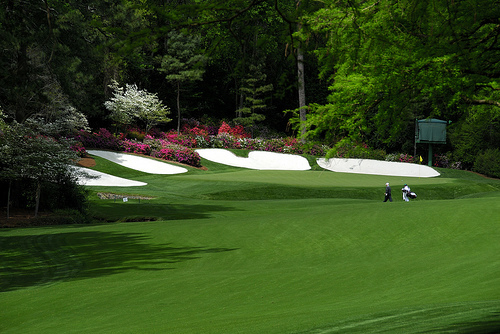 Augusta National is a Depression-era course built when 250 yards was a respectable professional distance off the tee. Steel shafts were just being introduced and golf ball technology was still rudimentary. For decades, Augusta was a test that matched the capabilities of the day’s best golfers. The latest insult was Bubba Watson, whose length two weeks ago mocked August’s most difficult holes. In ten years, there will be fistfuls of players who hit the ball just as long. What then? The Augusta membership is proud of its course, unique in the world and one of the world’s most challenging. Yet, the membership is trapped by it, too. The Masters has always been played there; it was meant to be played there. The Masters and August National are one and the same. There is no other place where the Masters can be held. The USGA is rotating its championship to newer courses able to keep up with today’s golfers, Merion East notwithstanding. That course was tricked up beyond belief in order to stand up. It could easily be the case that in fifteen years Augusta National will have no more slack to give. Its only defenses would be the pin locations on its forbidding greens. The tournament could be won the by the golfer who has the fewest three-putt greens over the four days of competition. A sad fate. At this point in the essay, I am supposed to present my proposal for a way out of this jam. How to salvage a seemingly lost situation. In this case, that might not be possible. The hard fact is that Augusta National was designed to play at about 6,800 – 7,000 yards. It has been stretched beyond that about as far as it will go. When its current 7,400 yards is no longer enough, the course might have to be retired. That happens to everyone and everything. We have our heyday, we have our glory. The time comes when we are overtaken, and we must take a seat on the sideline. The question is, will the Augusta membership be able to retire their course with dignity when the time comes, which it surely will?